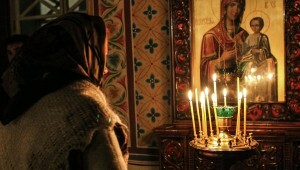 MOSCOW, December 24 (RIA Novosti) – The proportion of Russians who consider themselves Orthodox Christians has risen four-fold in the past 24 years, according to a new survey. Two out of three Russians now regard themselves as Orthodox Christians compared to just one in six in 1989, when the Soviet Union was nearing dissolution. The poll of 1,603 people by the independent Levada Center found that 68 percent described themselves as Orthodox Christian now, up from 17 percent in 1989. The proportion identifying themselves as Muslim has also risen from about 1 percent in 1991 to 7 percent today. The number of Russian Catholics and Protestants has remained roughly the same, at about 1 percent. About one in five Russians, or 19 percent, said that they had no religious belief compared to 75 percent in 1989, when the official position of the state was atheist, and 53 percent in 1991, after the Soviet collapse. Most Orthodox believers are not regular church-goers, with only 4 percent saying that they attended services once a week. Some 35 percent said that they never went to Church, while 17 percent said that they attended services a few times a year. Some 62 percent of Orthodox Christians and Catholics also said that they have never received Communion, down from 83 percent in 1991, while 8 percent said that they took part in the sacrament a few times a year. The poll was conducted on November 15-18, 2013 in 130 cities, towns and villages across 45 Russian regions. The statistical margin of error did not exceed 3.4 percent. After decades of repression and official disapproval, the Orthodox Church in Russia has gained greatly in influence in the past 20 years. There has also been a major program of church-building across the country to serve the spiritual needs of believers.